The Airpower XR3 also meets the EN ISO 20345 standard and fulfils the requirements of Safety Class S3 by offering a protective cap to the front and enhanced puncture resistance. Particular details, such as silver reflectors on the heel, make the boot a modern and secure option for professionals such as forestry rangers, tradesmen and industrial workers. Tradesmen wear their work clothing all day long. For this reason, the boots they choose need to be both robust and comfortable. The impact absorption properties of the Airpower XR3 cushion your steps as you move along to minimise any strain on the feet and joints. This promotes excellent toe-to-heel movement. The boot also supports the natural curvature of the metatarsus to reliably prevent malposition’s. Removable insoles ranging in size from extra-narrow to extra-wide mean that individual adjustments can be made to suit the form of your feet. An ankle-high shaft delivers stability, whilst the heel area is reinforced in soft leather to stop unpleasant rubbing. The HAIX Airpower XR3 is manufactured in water-repellent bull leather. It meets important criteria relating to health and safety at work and fulfils the requirements of Safety Class S3 by offering a protective cap, which prevents injury to the feet and toes from falling objects. This toe cap is made of glass fibre reinforced plastic and is substantially lighter than a conventional steel cap. An anti-slip and abrasion-resistant sole offers puncture protection. It will shield your feet should you happen to step on any sharp objects such as nails, shards of glass, stones or splinters during the course of your work. The sole also provides outstanding insulation against the cold and heat. All of this makes the Airpower XR3 a practical workwear option for any weather and season of the year. The Airpower XR3 by HAIX provides pleasant comfort of wear and meets all necessary criteria relating to health and safety at work. It is equally suited to both inside and outdoor use. This is a comfortable, high quality, watertight and highly breathable boot which offers a further and highly practical workwear feature in the form of a puncture-resistant sole. Try out the Airpower XR3 now! The HAIX Airpower XR3 is manufactured in high quality bull leather, which is also highly breathable. The leather in the upper of the boot reflects sunlight. This prevents overheating and makes sure that less warmth is transported to the feet. 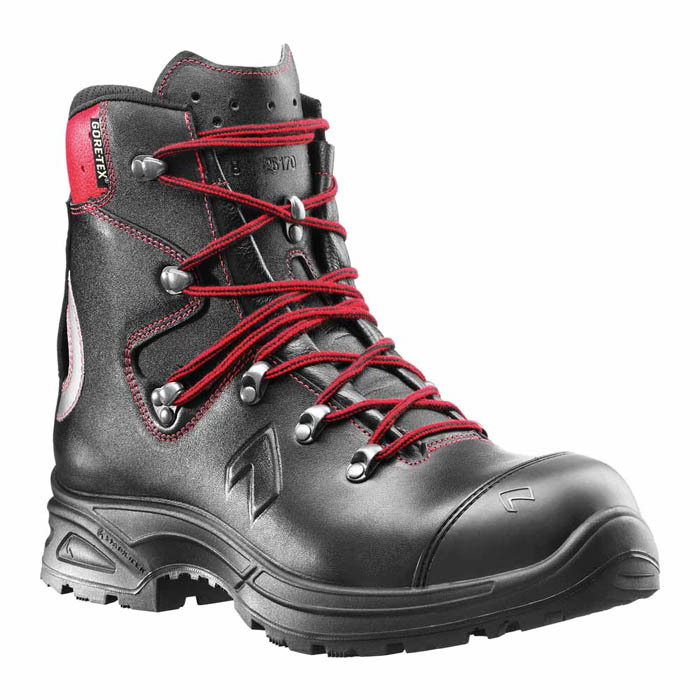 An additional protective rubber toe cap protects against wear and tear as well as making the boot even more robust. Reflectors in the heel area ensure that you are easily visible to others, whilst a light lacing element makes the Airpower XR3 very quick to put on and take off. A four-ply GORE-TEX® membrane prevents moisture penetration. This material is also highly breathable and thus effectively combats sweating. The anatomically formed protective cap at the front of the boot complies with the most stringent safety requirements and shields the sensitive toe area. A fast-drying fleece insole helps to absorb moisture and keeps your feet fresh throughout the day. The HAIX Airpower XR3 boasts a particularly abrasion-resistant inner lining. This guarantees a long product life, even when the boot is put to rugged use. A separate heel cup cushions your steps as you move along whilst also promoting good toe-to-heel movement. A soft and highly abrasion-resistant microfibre material at the rear avoids any unpleasant rubbing. Three different inlay soles are available to allow you to adjust the width of the shoe to suit your own individual needs. These can be removed and washed if required. The Airpower XR3 is shipped with the red inlay (medium) as standard. Additional Vario Fit inlay soles can be ordered. The sole of the Airpower XR3 features a tread with particular anti-slip properties. This guarantees a firm foothold and a good grip on slippery, wet and difficult terrain. The sole is also light, flexible and puncture resistant. The latter property provides important protection should you step on any sharp articles. The sole of the boot gives outstanding insulation against the heat and cold to leave your feet feeling comfortable throughout the year. It is resistant against oil, petrol and heat as well as being colour fast to avoid the possibility of leaving ugly dark marks on light-coloured floors. A light integrated and impact-absorbing PU wedge provides outstanding toe-to-heel movement whilst also decreasing pressure on the joints and spine.